It seems like everybody uses the free PuTTY client for accessing SSH from Windows, but the lack of a tabbed interface has always baffled me. With the PuTTY Connection Manager you can not only use tabs, but also wrap PuTTY in a slick interface. The underlying client is still the same putty.exe that you are used to… in fact the application doesn’t even come bundled with it. The first time you launch the application you’ll be asked to enter the location to your copy of PuTTY. And finally, a tabbed version of PuTTY! The connection manager can be docked to the side by using the little pushpin button. In the configuration dialog you can specify a bunch of options including an automatic login macro or passing command line parameters to putty. 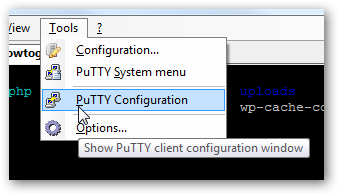 You can either click the configuration button above, or choose PuTTY Configuration from the tools menu. Which brings up the PuTTY Configuration dialog for the actual putty.exe underlying application. There’s a lot more features to this application that I haven’t gotten to yet… you can even change the theme.